When friends and acquaintances ask me about homeschooling, my response tends to sound like rainbows and roses. Not because I intentionally spin homeschooling in a golden-hour glow, but because we love it so much. My husband often warns me to send people to him to chat about homeschooling after they have spoken with me -tongue-in-cheek, of course. So today, let's talk about the hidden costs of home education and counting those costs. Did you count the costs at first or did you just jump in with both feet? I recently read through Educating the WholeHearted Child again (by Clay and Sally Clarkson). I appreciated the section in chapter one where Clay talks about counting the costs. I recommend their book! Check your library for it. 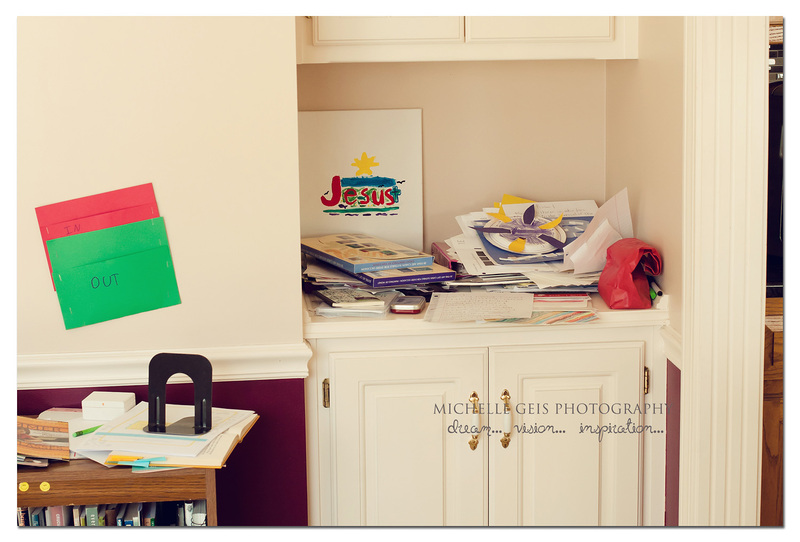 Homeschooling will change you; it will change your parenting; it will change your heart. Are you ready for that? WERE you ready? I wasn't - at first, but now I am so thankful. I am a better parent for my decision to homeschool. One of the things I have learned is that I can't HIDE from my children on bad days, messy-house days, or sick days. I can't pretend life is grand when my head feels like it's going to split open or when our schedule has become overbooked. My children can see right through any mask I might try to paint on during those tired and cranky days. I have learned that they can see right through me so I might as well get real and honest with them. What a blessing in disguise. Homeschooling has brought me so much closer to my God, my ever present Help. I can do anything through Him, right? 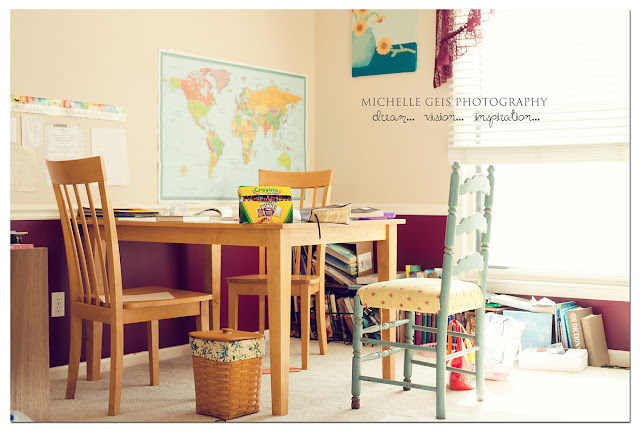 Homeschooling will change your life in unexpected ways. Some changes take prayer and sacrifice to accept and some changes are blessings in disguise. I have finally embraced shopping with my children. I have learned to involve them - not just in meal planning, but even in the budgeting and selecting. And guess what? They are excellent helpers! The only time I blow the budget now is when I shop alone. When they are with me, we run by the bank first and pick up cash. My three little ones arm themselves with calculators and diligently subtract away as we add items into our cart. When we get close to our goal we have to start making tough choices. Do we pick up an extra pack of nitrate-free bacon or that dark chocolate bar as a treat? Do we still need 8 pounds of organic apples this week, or can we substitute a pound or two of the bananas or oranges that are on sale? My children never cease to amaze me in their decision-making capabilities. Have you surrendered your home and housekeeping? We just recently moved and not everything is in place, yet. We needed to get back to our studies, so much of the painting and arranging will have to wait for summer. 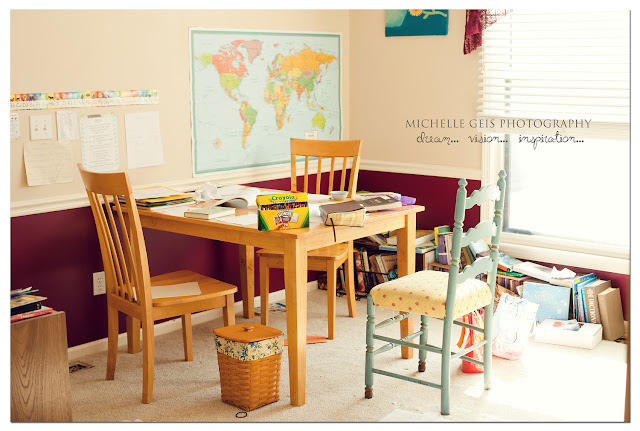 I have a spacious dining room, that has become the homeschool room. 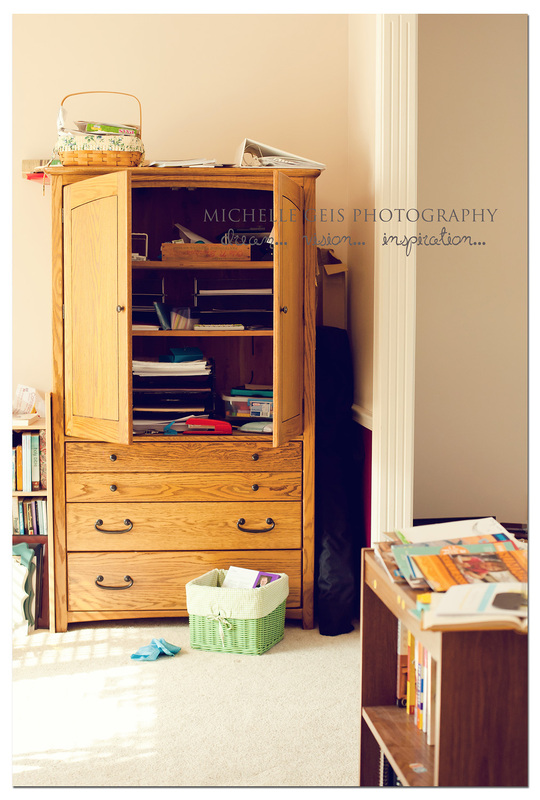 We are planning out built-in bookshelves for the dining/homeschool room, but that will have to wait until summer. In the meantime I have cardboard boxes as book shelves. 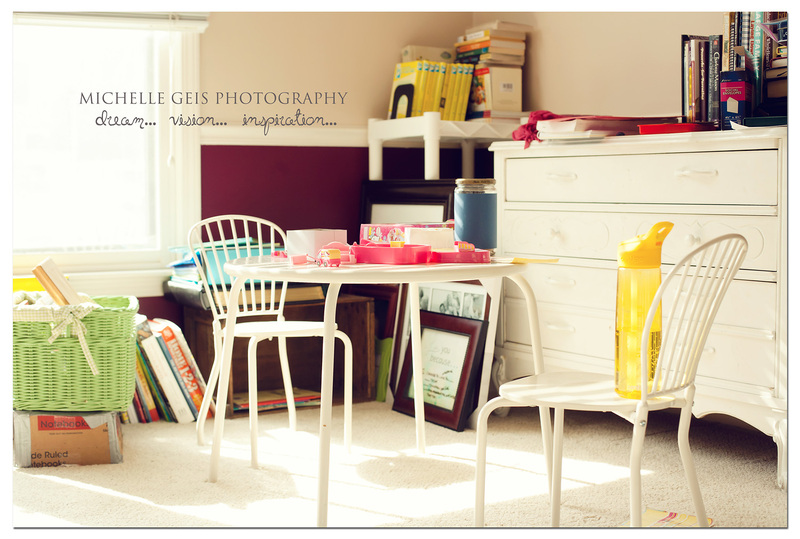 In our last house we didn't have a homeschool room at all. Our books and supplies pretty much took over the living room, and well - the whole house. Even now with a dedicated room, we have to be diligent to keep it contained. My early-rising 10 year old prefers to do her math in her bedroom as soon as she wakes up - even before breakfast. My little guy likes to do his math lying in the floor. Reading happens everywhere all at once - literally. Science typically happens in the kitchen and dining room. My house often looks like a paper explosion. There are papers, memory scriptures, notes, maps, and art randomly stuck on my walls. I do try to keep this limited to the homeschool room, but its there. 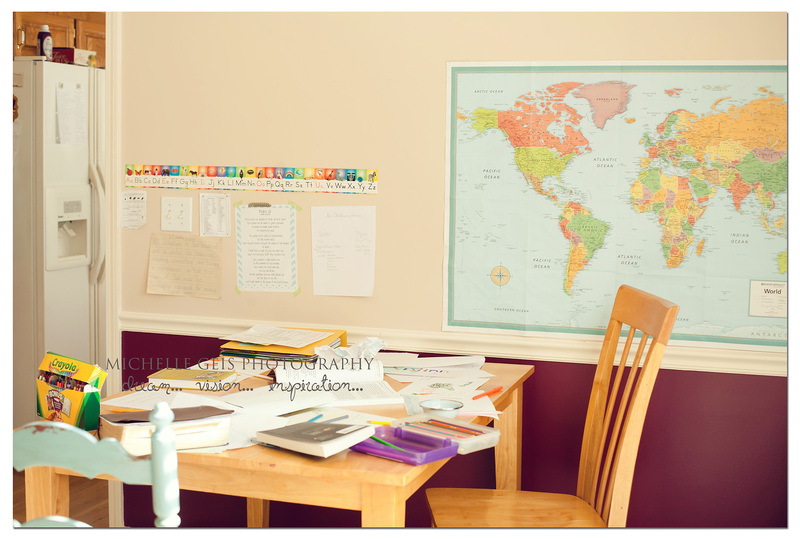 Flip side is everyone seems to love huge wall maps. I would love to have another. It's a great conversation piece! There are random toys mixed in with school and water bottles left all over the house. Everyone has their own summer and winter water bottles and I am constantly chasing them down. And there is no doubt that learning happens in this home. See that pile on top of the white counter space? That's my to-be-filed pile. I promptly cleaned that up as soon as this picture was taken, but I know it will return. I am outnumbered by my children, after all. Keeping up with them is a full time effort. What costs have you had to count? What unexpected sacrifices and blessings in disguise have you encountered? Linked up with ABFOL One Project at a TIme, Mom's Library, Teach Me Tuesdays and Titus 2 Tuesdays. Thank you God for my amazing wife and children! And, she is right, it will change you.. in all of the ways it is truly good to be changed.. and He is still working on me. I am not all that I will be but praise God I am much different than I was. Chelle, believe it or not, this post made me cry. Thank you so much for being genuine. And being an encourager. And being a reminder, a support and a friend. I need to be more thankful for this thing called homeschooling--and my children. They are gifts that bring unexpected sacrifices and blessings. One of mine unexpected sacrifices is my time. My time doing stuff that I want to do and nobody else really cares about. (I mean they do because they love me, but that's not the point.) I know that seems elementary, but I guess I had this grand illusion that we'd always finish by noon and they'd play happily together while I painted and sewed. (Yes, please laugh. It is a very humorous picture.) 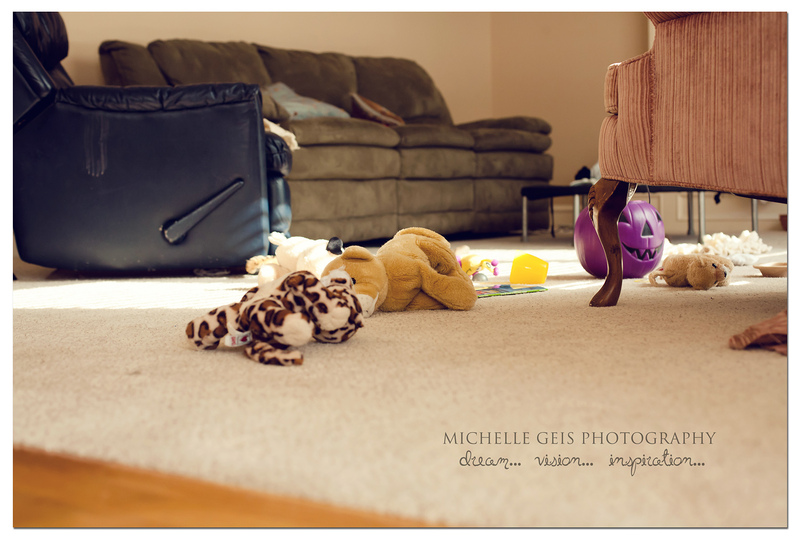 Not to mention the state of neatness (or lack thereof) and organization of our home. Which can change in an instant. Those "reading everywhere all at once" times--I try to embrace them because it brings me joy when I do--even though I can't say the chaos of it comes to me naturally. Thank you for the encouraging words! Ashley, I will definitely check out your blog. What a lovely post! Educating the Wholehearted Child is one of my favorites. I've read it 3 times through, hmmmm, needing another read, I think. Thank you for pointing us to the joy and loveliness in our messes. The sacrifices? Yes, there are some. But, would I change my life with someone else just to have what I think I might be missing? No way! So, maybe this chaotic messy life I live is not such a sacrifice. I gave up my name - I'm now called Mo-om by so many I think I've forgotten my name! The pleasure of finishing a phone conversation with a friend without interruption - a dream for many years. But now my 'littles' are getting to be 'middles' and 'olders' and I find it is easier to grab those moments more often. Oh, my. Look at me rambling -- we are blessed abundantly - thank you for that reminder! I love your "rambling"! Thank you for sharing. It's so good to hear about other people journeys.